The Dining Room Bookcases - Oak House Design Co. I got the Dining Room put back together this weekend. Looking at the finished product, I can't believe I waited so long to finish them off. I didn't think I could have the bookcases in this room with my table, but I love the final result. I have been collecting white dishware and dinnerware for over a year now from yard sales and the clearance aisles of Target and other stores. I have a slight addiction to it. But now I am able to see it all and easily pull it out without going to several different locations in my house. Hopefully that will help me entertain more. It's got a little French Grey + Burlap, so I'm happy! This is a before picture below. I mentioned in a previous post that this was originally a dining room, but it had been converted to a playroom. These were the basic pieces in the playroom, though this photo was taken right before we got new flooring. Thus the sparse looking space. In the future, I'll have to show how I attached the bookcases to the wall. I've been wanting some open shelving for dishware ever since I saw Layla's over at The Lettered Cottage. I have yet to take the doors off any kitchen cabinets, but I do have plans to add some open cabinetry soon! Then some of the shelving here will convert back to books. For now, this is what's on the shelves. The drink dispenser is one of my favorite things that I found at Marshall's about a year ago. I added a tag from Jones Design Company with some jute twine and stamped 'drink up' on it. This is also the bookcase that has the thermostat inside it. My little plant hides it. This is the center bookcase, and I really love the little fern. I think a little greenery adds life to a room. The bookcase nearest the window holds my candles, outdoor dinnerware, and more natural elements. I love natural colors and textures. When my son and I go to the park, we love to collect leaves, pine cones, acorns--you name it. It brings a garden feel to an indoor space. And since it's fall, it's nice to bring those elements in since cooler weather will be here soon. 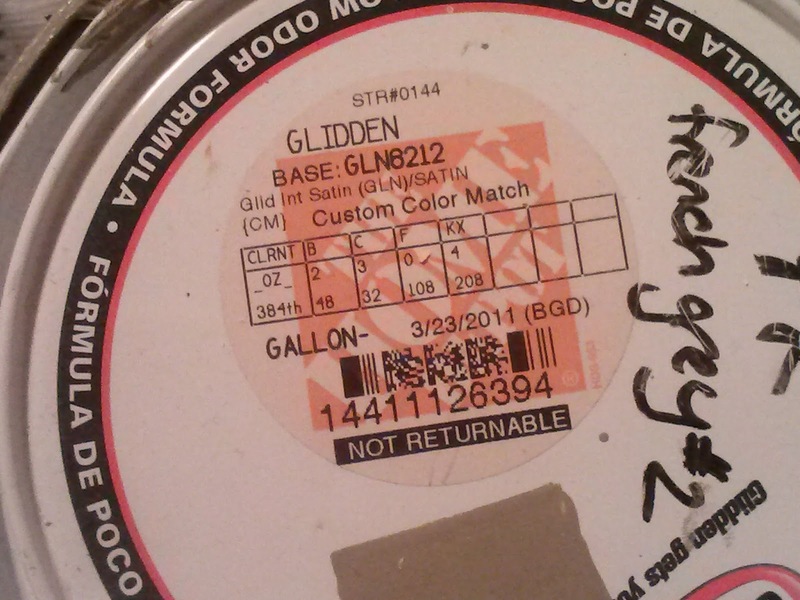 Update: Many of you asked about the paint color. It was a color I custom mixed. Although it probably matches a color in some paint line, I couldn't find it at the time I was looking for the perfect grey. Below is a pic of the formula from the paint can. I had it mixed in the Glidden brand in a Satin finish. I hope this helps! Hi Melanie! I love your bookcases and the way you styled them! I need to go and check how you gave them that "build in" look! Thanks for leaving such a sweet message on my blog! I tried to respond to it by e-mailing you, but you have a no-reply address, neither you have a link to your blog through your Google profile! It was kind of hard to find you! But I'm glad I did! Thanks for coming over! I think I got it fixed! Hi Melanie - so nice to " meet " you - what a beautiful job you did on thos bookcases - did you add the beadboard to the back? ( I know you added the molding, right? Nice to meet you too! Thanks for stopping by! I did add the beadboard--directly to the wall. I nailed in two 4'x7' sheets and then pushed the bookcases up against the wall and screwed them into the studs. I am planning on detailing it a bit more in a future post. Headed over to check out your blog! This is really pretty and great styling on the shelves. These shelves are just gorgeous! Love the styling on your shelves-pinned it! I am sharing this as one of the features at Wow tonight. Woohoo, I'm excited! Thanks again. Thanks, you know that was one reason that kept me from making them built in for so long. I kept thinking, "You can't put your thermostat in the bookcase!" But I finally decided it was my house, so I could. And I did. Thanks again for reading. I saw your feature over at Kim's. Welcome to blogland. Love the shelves. You have everything so well displayed. Your shelves look outstanding...you did a wondrful job with all the displaying. Really like the shelf styling you did! I'm pinning it too! I'm now a follower also:) Welcome to the blog world! Beautifull shelves and I love how you have everything displayed. You have so many pretty items and your greenery looks really nice too! So pretty! I love the shelves and all of the lovely items you've displayed so beautifully. Great job! Your shelves are beautiful. You have great collections and display them so well. Gorgeous! Beautiful! Love the way you styled the shelves. I Love it! This is my favorite project I have seen in a while! The styling is beautiful and functional! Perfect match. I came over from Savvy Southern Style! Artful styling. So attractive and inviting. Can't wait to see more of your posts. Thanks. I love what you did!! Impressive. What color is that on the bookcases?? I love it....Did you put the beadboard on the back? Wonderful! Hi, it's a custom color I mixed myself, but I'm going to write a post with the color info and how I did the beadboard soon. So please check back and thanks for visiting! Beautiful job. Love the styling and color! Beautiful everything, color, styling, room. and YOU! I would love to know what the color is on the bookshelves. Just love it!!! I'm a new follower!! Happy Thanksgiving!! Thanks so much for your kinds words. I used a stain and wax which I have since heard is a no-no, uh-oh! But I wanted the limed wood look. So, I stripped the original finish and applied alternating coats of Minwax Early American stain and Briwax Liming Wax. I still need to apply a few coats of clear wax to protect the finish. If I were to do it over, I would probably try the new stains that have the driftwood/gray wood finish to get that perfect gray color and still be able to polyurethane over it. With the wax, you can't use polyurethane. Hope that helps! Thank you for answering me so quickly!!!! As you can tell I am not that quick. I have used the driftwood/gray and it is beautiful. That is what I thought you used!!! The pieces look beautiful together. I have realized, you can have the most expensive pieces of furniture but if you can't display items correctly ---well you know what I am trying to say!!! You have a natural talent for it! I am a believer that it is God's gift. He definitely gave it to you! I haven't used the wax finish yet but it certainly gives a different appearance than using the normal polyurethane even satin or matte. When you use wax, how do you clean it for everyday use? I guess I keep thinking that the wax will come off and not protect the piece. I am so thankful I came across your site. This is the best I have seen in quite sometime. You have exquisite taste and it shows!!! You have a new follower, so keep showing your great talent! Thanks again for your kind words. We actually don't use this table on a daily basis. But I wipe it down just like I do my kitchen table I am a little nervous about the finish myself, but even the directions on the can suggests applying a few coats of clear wax for additional protection. So that's on my list to complete the table project. I totally agree about the wax finish being totally different! I love the matte finish, although I saw recently that Home Depot has a matte finish polyurethane by Varethane I think. They also carry the driftwood gray stain. Is that the one that you have used? I would love to see a pic of that and know what kind of wood you used it on. Thanks again, and I am hoping to post more in the future. So check back!